President Mnangagwa has challenged the Harare Institute of Technology (HIT) to change the narrative of Zimbabwean discourse from technological theory and aspirations to acquisition of real and tangible research innovation outputs that add value through setting up new industries. He said this in his acceptance speech after being installed as HIT second Chancellor during the university’s ninth graduation ceremony yesterday. “Universities and HIT in particular must drive the innovation and commercialisation of technologies that will result in the creation of enterprises that will create jobs and benefit Zimbabwe in all sectors,” said President Mnangagwa. “Building on your machine design and reverse engineering capabilities, I exhort you to assist in the mechanisation of our agriculture, retooling and modernisation of industries, as well as improving the processing and manufacturing capabilities of SMEs. “As Chancellor, I am aware of the challenges facing institutions of higher learning in general and HIT in particular with regards to institutional sustainability. “My Government will continue to make concerted efforts to facilitate the provision of the broad array of needs. “I am also assuming the Chancellorship at a very interesting time for Africa and Zimbabwe in particular as we are poised for an economic, industrial and technological boom. 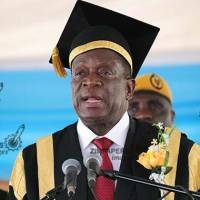 President Mnangagwa continued: “This development — together with other unfolding developments in the agriculture, mining, health, manufacturing and services value chains — compels HIT and other universities to aggressively respond to the new prospects within our country. “In view of the broader new skills requirement in our country, I urge the Ministry of Higher and Tertiary Education, Science and Technology Development to revisit the mandate of ZIMDEF so that it facilitates the new skills and training needs in line with the new realities. President Mnangagwa said he was committed to the development of HIT into a world class institution of technology with all the requisite infrastructure for high-tech research laboratories and other complementary facilities. “HIT remains an important and integral part of national development. I note that the university now has teaching personnel with competencies that cover new generation technologies such as nanotechnology, bioinformatics, big data analytics, sensor technology, biomedical engineering, machine design, renewable energy among a host of other skills. President Mnangagwa said graduation at HIT was not about numbers, but to conquer and overcome the traditional teaching, research and community service functions of higher learning institutions. He urged HIT to scale up linkages with other world renowned institutions to improve, develop and domesticate new technologies that match Zimbabwe’s conditions.